When it comes to sprinting, John Smith of HSI needs no introduction. I’ve covered some of his philosophies and concepts plenty of times in the past 9 years. But one of the most important concepts is Rhythm… it’s often ignored or forgotten! They all have rhythm for the first 250 or 300 meters. These guys are smooth! Thus, a good sense of pace and rhythm is therefore crucial. If a 50 second 400 meter runner with a 23 second PB is asked to go out in 24 (followed by a 26) what happens if he goes out in 23.5? Or 24.5? The secret is RHYTHM. You have to know PACE. Every distance runners knows how to pace, say 8 min per mile or 5 min per kilometers. Sprinting at top speeds is another matter. 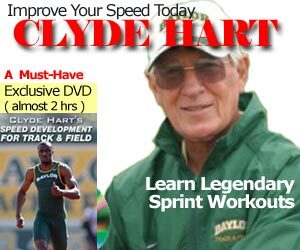 The following is a workout that John Smith of HSI (and former coach at UCLA) recommends in his Sprints, Starts and Relays DVD video to develop the correct sense of pace and rhythm in the 400 meters. I own this copy in VHS and now it’s re-released in DVD. In short, it’s a series of 7 x 100m that take the athlete completely around the track, so the turns and straights are negotiated just as in an actual 400 m race. Great for visual & mental work! You will need cones at every 50m interval. The workout begins at the normal 400m starting line stagger. From this point the sprinters run 100 m at race pace. 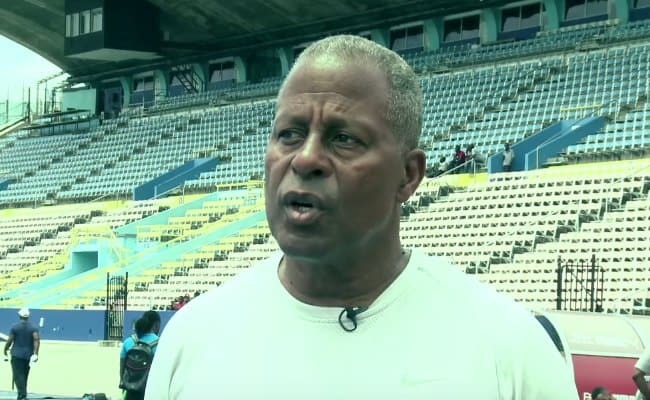 For example, if you want your athletes to reach a time of 50 sec (or 49 sec on the fly, allowing 1 second for acceleration out of the blocks) in 400m, they should aim to cover each 100m in 12.25 sec on the fly. A 50 second quarter-miler usually has a PB of 11 low, and can easily run 10.5 for 100 meters on the fly. This means training an intensity of 85%… something short-to-long coaches shiver at. S-L coaches believe in either 75% or lower, or 95% or higher intensities. After the first 100m, the sprinter JOGS OR WALK BACK 50m (marked by the cone on the track) and run the next 100m in 12.25 sec. The sprinter can start 10 meters back and get a running start. Rinse and repeat until you have finished 7 x 100m, or when you reach the 400 meter finish line. Variations include starting out with fewer reps (i.e. starting out with 4 or 5), varying the recovery, or even doing longer distances such as 150m. This type of short recovery works the aerobic component… something that would make Clyde Hart very happy! Of course, stop the workout when times or mechanics degrades. If you’ve done this type of workout, please comment below.